In the days when Lotus was a major force in software I wrote plenty of campaigns for its Asian marketing efforts, despite often-tiny budgets and limited creative breadth. This campaign took a tactical riff on a worldwide concept spanning TV, radio, print and the web, although our little campaign didn’t get to star comedian Dennis Leary. 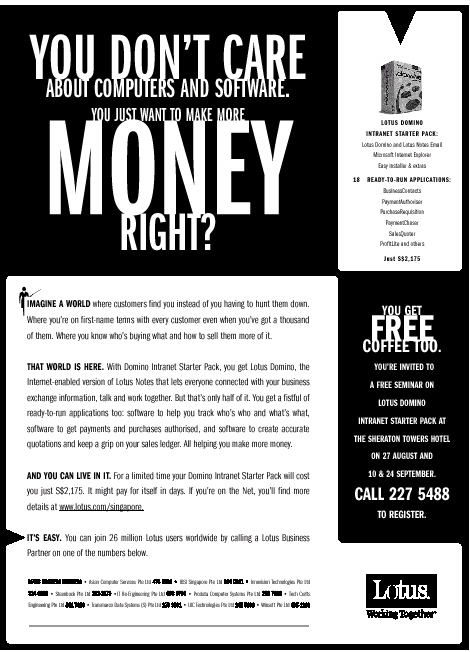 Here it is in PDF too. Head: You don’t care about computers and software. You just want to make more money, right? Copy: Imagine a world where customers find you instead of you having to hunt them down. Where you’re on first-name terms with every customer even when you’ve got a thousand of them. Where you know who’s buying what and how to sell them more of it. THAT WORLD IS HERE. With Domino Intranet Starter Pack, you get Lotus Domino, the Internet-enabled version of Lotus Notes that lets everyone connected with your business exchange information, talk and work together. But that’s only half of it. You get a fistful of ready-to-run applications too: software to help you track who’s who and what’s what, software to get payments and purchases authorised, and software to create accurate quotations and keep a grip on your sales ledger. 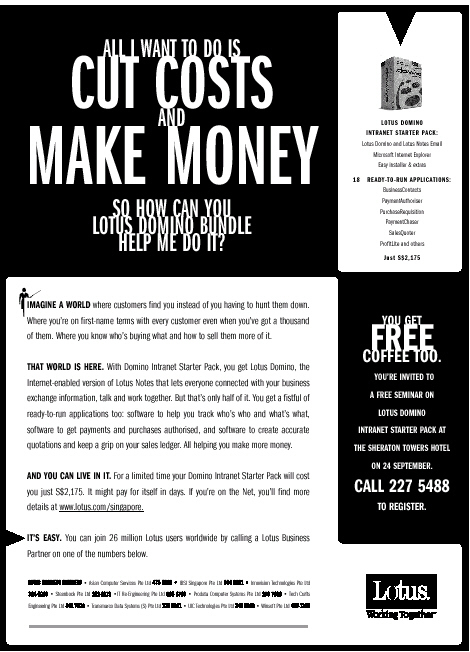 All helping you make more money. AND YOU CAN LIVE IN IT. For a limited time your Domino Intranet Starter Pack will cost you just S$2,175. It might pay for itself in days. If you’re on the Net, you’ll find more details at http://www.lotus.com/singapore. IT’S EASY. You can join 26 million Lotus users worldwide by calling a Lotus Business Partner on one of the numbers below. Head: No doubt you’ll still work 12 hours a day. 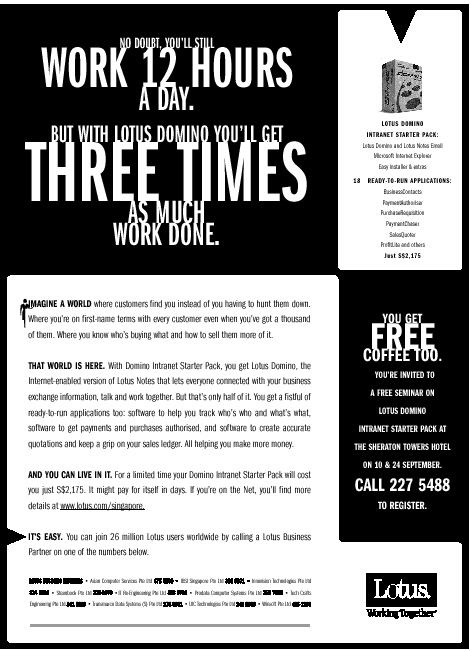 But with Lotus Domino you’ll get three times as much work done. Head: All I want to do is cut costs and make money. So how can your Lotus Domino bundle help me do it?